We have a few vacancies that we’d like to fill and there has also been a shuffle of some seats, read the full story for more. We are holding an open rehearsal on Thursday 2nd October to perform our programme for this weekends Bolsover Entertainments Contest. It is being held at Blackley Community Centre starting at 8pm, the programme is 20 mins long. There is no charge for the evening and we will welcome all feedback. 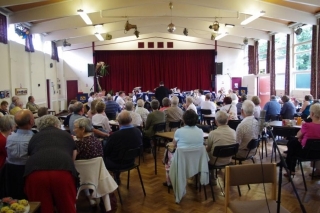 Join us for our annual Cream Tea concert at Blackley Community Centre, Victoria Avenue. 29th September at 2:30pm. It’s £5 entry with refreshments.